The disappointment of yet another cancelled Frostivus has given way to preparations for the annual Dota 2 springtime event, New Bloom. And the thawed fingers of crafty community modellers have begun to yield miniature masterpieces. Some are items based around the themes of Chinese New Year, Chinese history and springtime, as requested by Valve – but this one belongs to the cult of GabeN, which lasts all year round. 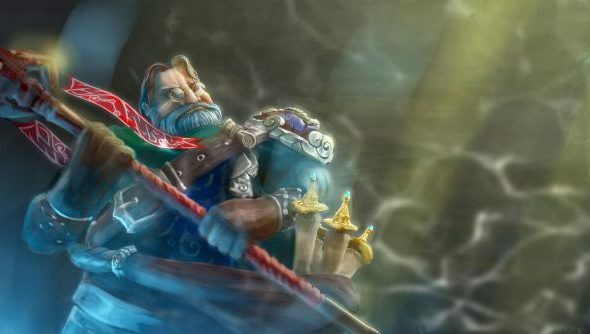 Community item creator down_limit has built a modified shopkeeper in “gratitude to the development team” – who he credits with a “huge leap” in the propagation of eSports over 2014. You can upvote the model on the Steam Workshop. down_limit’s Gabe fits the unflattering proportions of Dota’s shopkeeper. The Valve founder wears his trademark circular specs and a serene, slightly bemused smile befitting one of the deities of PC gaming. You’ll also notice little Steam logos secreted into the trim of his staff. Valve put out the call for New Bloom items at the beginning of December – asking for work that evoked the spirit of Chinese New Year without muddling cultural concepts like the traditional dress of children and adults. They’ll be taking submissions until January 19, so there’s no reason they can’t still welcome Shopkeeper Gabe into the update, thematic coherence be damned. I’m on board, so long as Shopkeeper Gabe stands at an anvil and mutters, “These things, they take time,” as he once did in CLANG’s Kickstarter pitch. How about you?